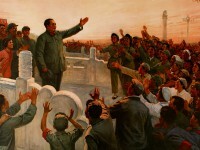 Song Wenzhi was a leading ink painter from Jiangsu, active in Nanjing throughout his career. He produced many landscapes in which depictions of modern construction and progress appear as minor elements. including several depicting shorelines punctuated with pylons. The painting in this poster is dated 1972 and so was painted along with the group of works Song Wenzhi submitted to the 1973 National Serial Picture and Chinese Painting Exhibition organized in Beijing by the State Council. 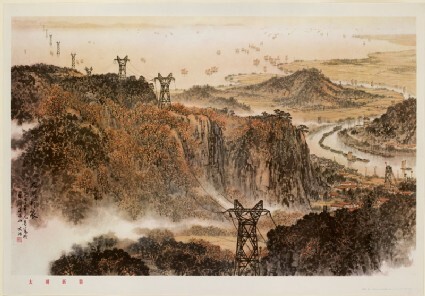 He has inscribed it : ‘painted at Xishan at Dongting in Suzhou, March 1972’. The inscription is followed by the artist’s seal, which is also reproduced on the poster.